This moist cake, originally from Cooking Light, was already pretty low in fat – only 7.8 grams of fat/serving. But I wasn’t really thinking about a nice dessert. I wanted a cake that I could slice slabs off to pack in my lunch, or to eat as a snack when I get home from work. I also, as usual, had an excess of produce – blueberries – and an aging lemon. This is very tasty, although not very lemony cake. It actually tasted better the second day. Preheat oven to 350°. Coat a 12-cup Bundt pan with cooking spray; sprinkle with 2 tablespoons granulated sugar. Set aside. Lightly spoon flour into a dry measuring cup; level with a knife. In a medium bowl, whisk together flour, baking powder, baking soda, and salt. Place the 1 3/4 cups granulated sugar, butter, and rind in a large bowl; beat with a mixer at medium speed until well blended (about 2 minutes). Add applesauce, beating for one minute. Add egg and egg substitute i1/4 cup at a time, beating well after each addition (about 4 minutes total). Beat in vanilla and sour cream. Add flour mixture; beat at medium speed just until combined. Gently fold in blueberries. Spoon batter into prepared pan. Bake at 350° for 1 hour or until a wooden pick inserted in center comes out clean. Cool in pan 15 minutes on a wire rack; remove from pan. Cool completely on wire rack. To prepare glaze, combine powdered sugar and lemon juice, stirring well with a whisk. Drizzle over cooled cake. Confession: I wasn’t very satisfied with the texture of this cake at first. I expected it to be lighter, but it began to brown at the end, and even though the wooden pick wasn’t entirely clean, I took the cake out of the oven. At first I thought it was under done, or that maybe my baking soda had gotten old. But after a day, it seemed ok, and wa moist, not pasty. Just one more blueberry recipe and then I’ll move on to other goodies. I promise. A blueberry muffin recipe appeared in our local newspaper. 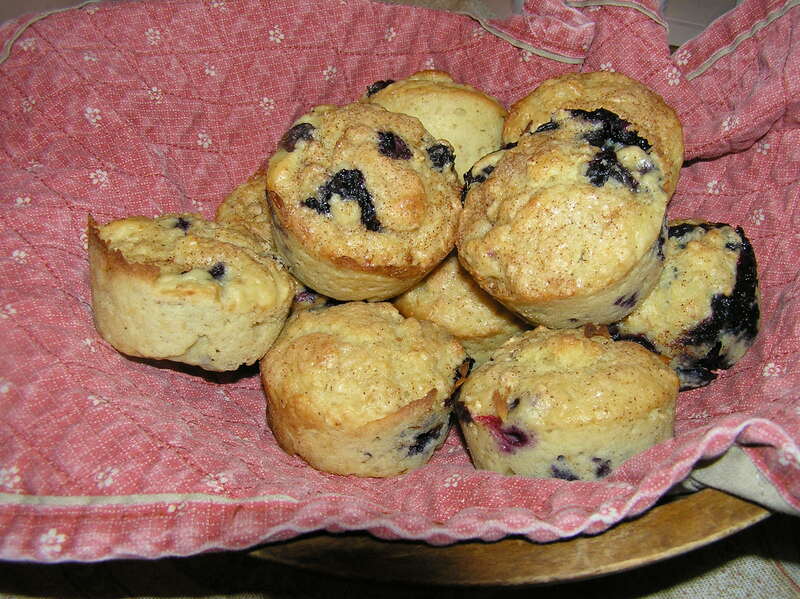 They were called The Ultimate Mazama Blueberry Muffins, and the recipe originally came from a small country inn in Washington State’s Methow Valley. Calling something the “ultimate” always makes me want to see if it is my ultimate, too. 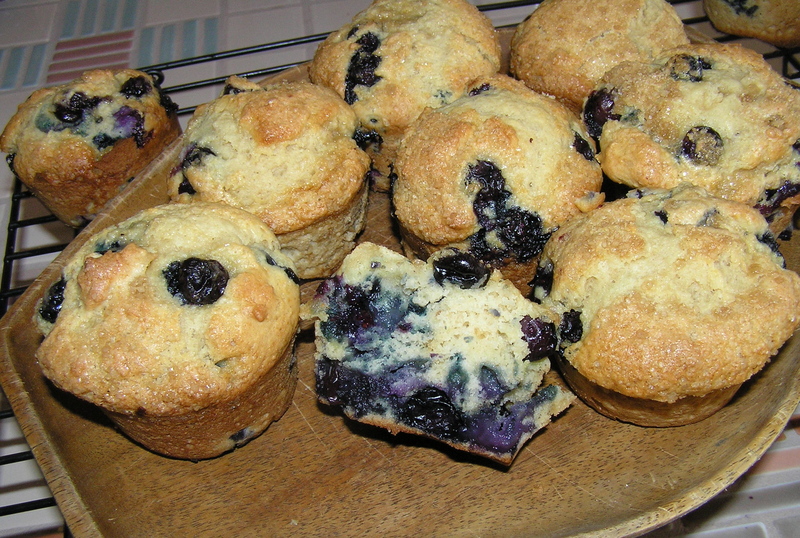 Well, I don’t know if they are the ultimate blueberry muffin, but even with my taking most of the fat out, they are pretty darn good. They have a nice light texture, moist without being heavy or dense. Warning – don’t start eating these when they are still warm…you might not stop at one or two. Combine orange juice and oats in a large bowl. In a medium bowl, whick together flour, sugar, baking powder, salt, and soda. Add to the oats along with the oil, applesauce, and egg substitute. Stir until just mixed. Stir in blueberries. Fill the 12 muffin cups evenly. Stir together the 2 Tablespoons of sugar and the cinnamon, and sprinkle over the top of each muffin. Bake for 18-22 minutes. Each muffin has about 2.3 grams of fat.